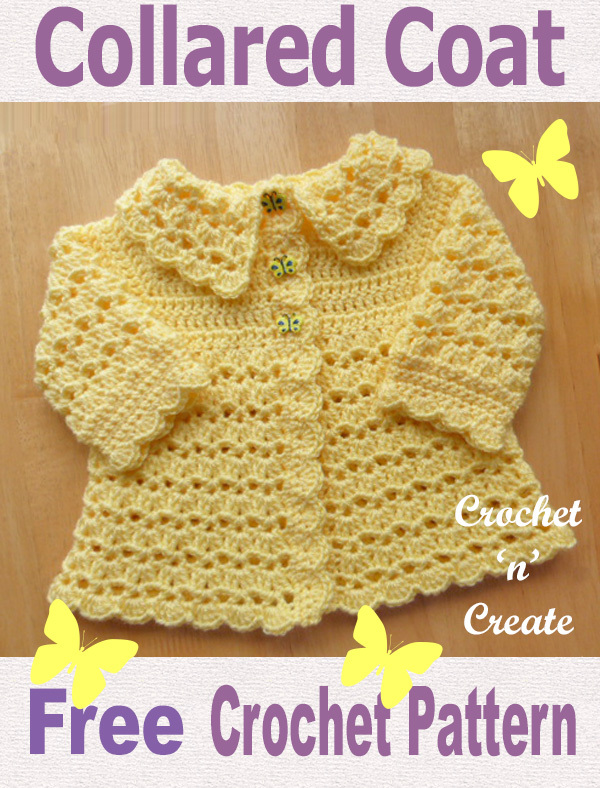 Free Baby Crochet Pattern Collared Coat – Beautiful V stitch and shell design coat with collar. 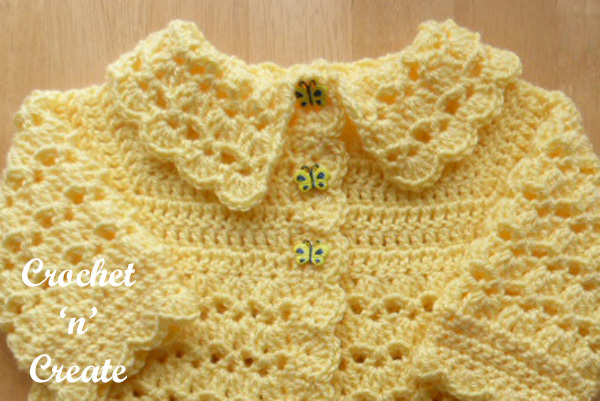 Finished with a single crochet and shell edge pattern, this pretty little coat crochets up in no time and would be ideal for those Sunday best days. See matching V-shell Baby Beanie Hat. King Cole Big Value Baby Yarn. 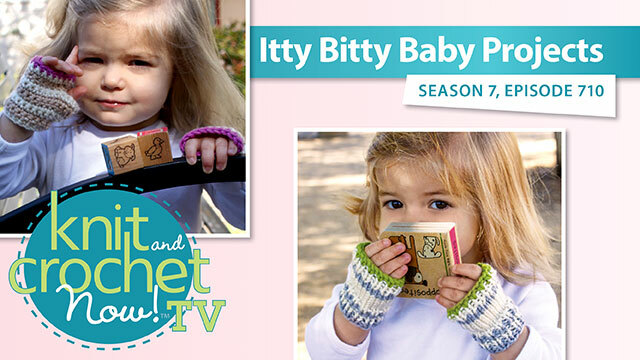 I have more free baby crochet patterns click the the links below to view. Dec. Insert hook in next stitch draw loop through (twice), yo draw through all loops. Starting with Yoke worked in one piece. 2nd Row – ch3, 1 shell in each vst to end, 1dc in top of ch3. Turn. 8” from shoulder. Change to 4.50mm hook and continue with 1st and 2nd Patterns Rows until work measures 10.5” from shoulder, finishing on a 1st row. Turn. Next Row – ch1, 1sc in base of ch1, 5dc in vst, 1sc between vst, * 5dc in next vst, 1sc between vst, * rpt from * to * to last vst, 5dc in vst, 1sc in top of ch3. Fasten off. Sleeves x 2 – With 4.00mm hook and with RS facing, rejoin yarn at corner of armhole edge, ch3, skip 1dc, 1 shell in next dc, *skip 2dc, 1 shell in next dc, * rpt from * to * 7 more times, skip 2dc, 1dc in corner, sl st to top of ch3 on beginning of row. Turn. (9 shell groups). Sl st at the end of each row, rpt 1st and 2nd Pattern Rows 4 more times each or until sleeve seam measures 4”. Turn. Next row – (Dec row) ch1, 1sc in base of ch, * dec 1sc over next 2sc, 1sc in each of the next 2sc, * rpt from * to * to last 3sc, dec 1sc over next 2sc, 1sc in last sc, sl st to first sc. Turn. (27sc). Work 3 more rows in sc. Turn. Button/Buttonhole Bands – Starting at lower edge, with RS facing and 4.00mm hook, work 45sc evenly up front edge to corner, 3sc in corner, work 1sc in each ch around neck, 3sc in corner, 45sc evenly down second front edge. Turn. Left Front – ch1, 1sc in base of ch1, work 1sc in each sc to neck edge, turn at neck edge. Buttonholes – With 4.00mm hook, return to right front, starting at neck edge and working downwards, work ch1, 1sc in base of ch, * ch2, skip 1sc, 1sc in next 6sc, * rpt from * to * once more, ch2, skip 1sc, 1sc in each sc, to end. Turn. Working in sc and ch1 spaces, work the 5dc group row of left front edge to match. Fasten off. Rpt 1st and 2nd Pattern Rows once, work 1st Row once. Turn. Next Row – Work ch1, 1sc in base of ch1, * 5dc in the next vst, 1sc between vst, * rpt from * to * to end, working the last sc in the top of the ch3. Fasten off. 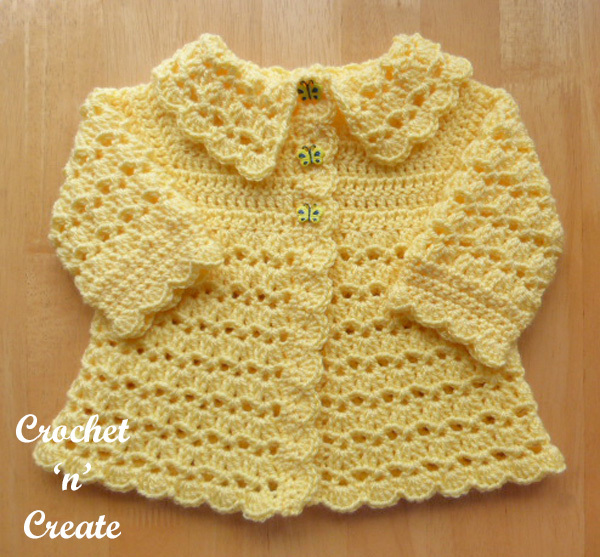 Finishing – Sew in and tie off any of the loose ends of yarn, sew on buttons to correspond with buttonholes, turn down collar. 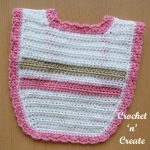 The written instructions and the pictures for this free baby crochet pattern collared coat are copyrighted to crochet ‘n’ create © 2018. 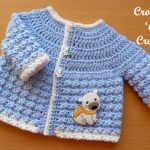 You are welcome to sell the finished products made from the free baby crochet pattern collared coat, I just ask that you please use your own pictures and put a link back to crochet ‘n’ create. 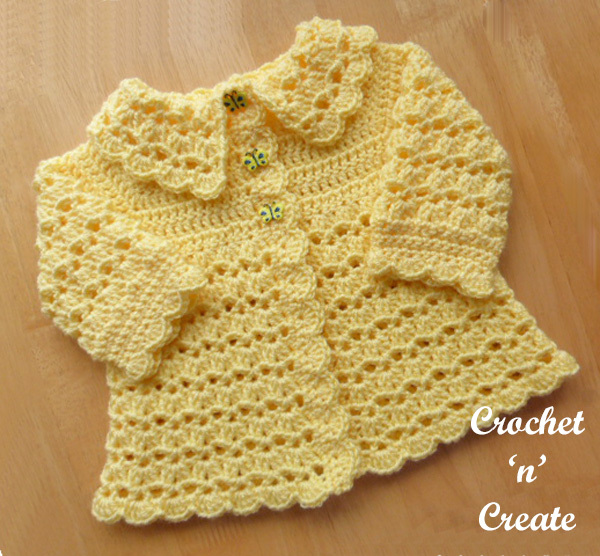 Please DO NOT share any of the written instructions for this free baby crochet pattern collared coat. 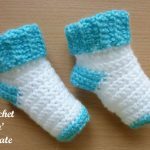 This entry was posted in Baby crochet pattern, crochet baby cardigan and tagged baby crochet, baby crochet cardigan, baby crochet sweater, crochet on 31st October 2018 by crochetncreate.